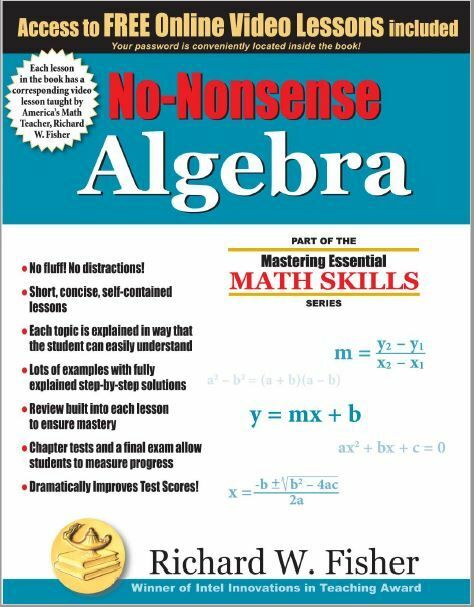 Math Essentials No-Nonsense Algebra is a system of teaching algebra, rather than just an algebra text book. My 12 year old was a little floored when I told her she was going to learn Algebra. She had heard that term with her high school brothers and it brought up 'hard math' for her mind. This being a learning approach to algebra, I felt she would do well with learning this way rather than putting an Algebra text book in front of her, several years from now. Her older brother actually used this book when he was in High School and was one of his most helpful math programs. There are five key parts to each lesson. The first is an introduction and explanation of any new topics. Next is a Helpful Hints section that gives important tips and shortcuts. Examples follow, listed step by step. There are then written exercises for each lesson, with answers in the back of the text (shh, don't tell the kids). Finally there is a review section that keeps the topics fresh in their minds. That in of itself sounds like a very solid study in Algebra. Add in though , video lessons for each section! In the book you will get an access code to video lessons by author Richard W. Fisher. My kids need much more than just reading the math book and understanding, and have long used online video math because of that. These pre recorded videos provided information to the kids without my needing to do it. This helped me in the juggling of multiple kids as well. The video gives examples that are different than the book, so this also gives additional examples. It is suggested to write out the examples, along with the steps so that the student isn't just reading it, but actually doing the steps along to help learn the process. My 12 year old hadn't started any form of pre algebra, and this book was a perfect start for her. I recall when my older son used it, he was able to double up some on the early lessons because he had completed a pre algebra program. It starts off basic, which was very helpful to my 'fearful' of Algebra daughter. This being her first exposure to Algebra, I chose to use this program exclusively for her. Between the video, the examples, and the worksheet problems, there was plenty to use. If your student just needed some reinforcement, Math Essentials works great for supplemental as well. Maybe with an older student struggling with Algebra concepts, this would be a great review program for them. The first chapter and 22 lessons introduce the basic tools of Algebra from dealing with integers, exponents, square roots, coordinate plane, LCM, GCM, rations, proportions, percents and more. This is one of the best Algebra programs we have worked with, both for a middle schooler, and as a supplement to a high schooler. See what my crew mates thought of No-Nonsense Algebra by clicking on the banner below.